Guy Montag is a fireman. In his world, where television rules and literature is on the brink of extinction, firemen start fires rather than put them out. His job is to destroy the most illegal of commodities, the printed book, along with the houses in which they are hidden. Montag never questions the destruction and ruin his actions produce, returning each day to his bland life and wife, Mildred, who spends all day with her television “family.” But then he meets an eccentric young neighbor, Clarisse, who introduces him to a past where people didn’t live in fear and to a present where one sees the world through the ideas in books instead of the mindless chatter of television. This is one of those classic novels that I confess that I’d never even considered reading until it was recommended to me on audio by an excellent friend of mine – I say ‘recommended’ but I’m not sure I had much of a choice in the matter… luckily for me, this coercion convinced me to give it a go and I’m so glad I did. In the first section, where Montag meets the young and vibrant Clarisse, I wasn’t sure the book was for me. It was the kind of profoundly wordy that doesn’t appeal to me in the slightest but it was LeeAnne’s recommendation and the performance of Tim Robbins that kept me going. About an hour in, all my reservations were gone and I was hooked. I’m not going to give a synopsis or analysis of the book… given that this is on so many required reading lists, I’m not about to tread old ground and bore anyone. What I can say though is that though the book was written in 1953 about a dystopian future set in an undisclosed era, the story has aged remarkably. 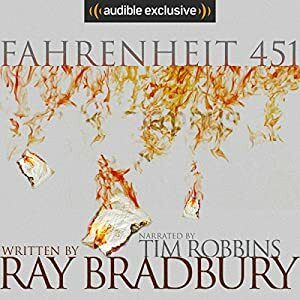 The concepts themselves are timeless, but with the existence of social media etc, it feels like we’re uncomfortably close to the future that Bradbury wrote about – ban anything that can be potentially offensive or upsetting, stir in some ‘alternative facts’ and we’re sitting in a fetid puddle of dystopia. Bleh. So, we can agree that this book is pretty timely and needs to be read by EVERYONE if they want to know where we’re heading as a planet. Now, on to the narration. This wasn’t even narration – this was a performance. Robbins voiced all of the characters in a way that took my breath away, he transformed into both sides of a conversation and drew you in. He added edge-of-your-seat drama to the story and has raised the bar for me when it comes to narrators. There’s a reason that this book is a classic and I desperately hope it’s not a prediction of the future otherwise its audience is going to be desperately limited in future! Wasn’t this just amazing? I don’t think I would enjoyed this as much if I was reading it- Tim Robbins did such an amazing job! So glad you enjoyed it! One of the first books I ever read. Bradbury is gold.